UPDATED: The last two charts now reflect recently-released data as of Q2/17, which showed continued strong gains in every measure of households' balance sheets. 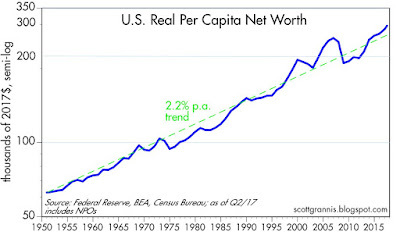 Net worth rose by $8.2 trillion (a gain of 9.3%) over the most recent 12-month period, driven by a $6.6 trillion gain in financial assets and a $1.9 trillion rise in the value of real estate holdings, which are now worth $2 trillion more than at the peak of the housing bubble in 2006. Total household debt rose by less than $500 billion in the past year, and now stands only $600 billion higher than the prior peak in 2008; household leverage (total debt as a percent of total assets) has thus fallen by fully one-third since the all-time high in 2009. 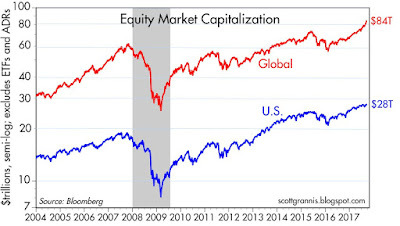 The global economy and global financial markets are huge, but just how huge? Answer: a lot bigger than most people realize. Here are some charts which help put things in perspective. They also show that what's going on today is not unprecedented nor extraordinary. As always, all the charts contain the most recent data available at the time of this post. Global GDP is roughly $80 trillion, about four times the size of the US economy. As the chart above shows, the global economy supports actively traded bonds and stocks worth $132 trillion, of which about 40% are US-based. 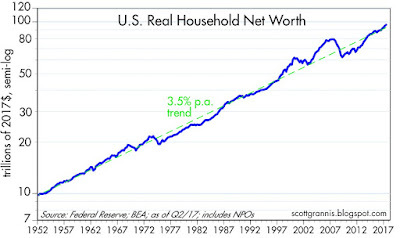 There's nothing unusual about any of this, considering that a typical US household has a net worth (stocks, bonds, savings accounts and real estate) equal to about three times its annual income. 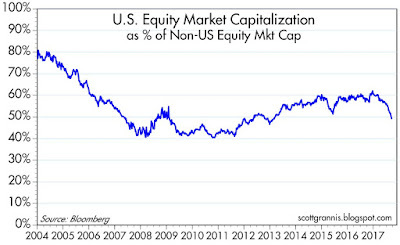 As the charts above show, the market cap of Non-US equities has grown at a much faster rate than US equities since 2004 (US equities have grown at a 5.4% annualized rate, non-US equities at a 8.9% annualized rate). US equities are now worth about 50% of the value of non-US equities, down from more than 80%. Non-US equities have suffered somewhat, however, due to the dollar's 5% rise (on a trade-weighted basis) over the period of these charts, but that's relatively insignificant in the great scheme of things. The defining characteristic of the current US economic expansion is its meager 2.1% annualized rate of growth, which stands in sharp contrast, as the chart above shows, to its 3.1% annualized rate of growth trend from 1965 through 2007. 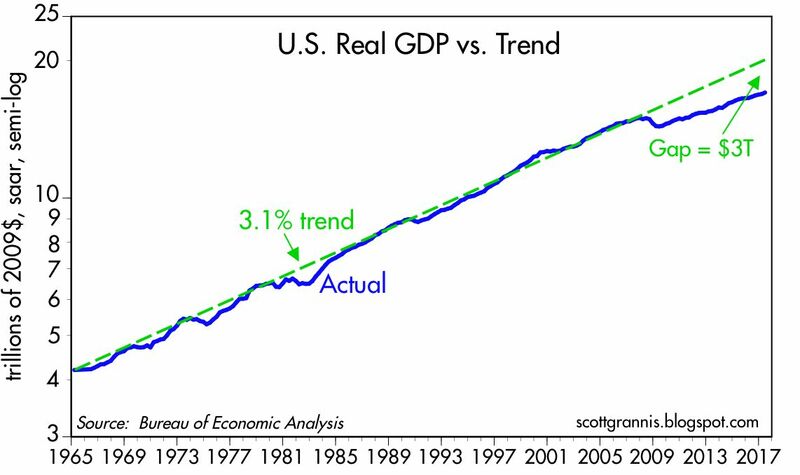 If this shortfall in growth is due, as I've argued over the years, to misguided fiscal and monetary policies, then the US economy has significant untapped growth potential and could possibly be $3 trillion larger today if policies were to become more growth-friendly. 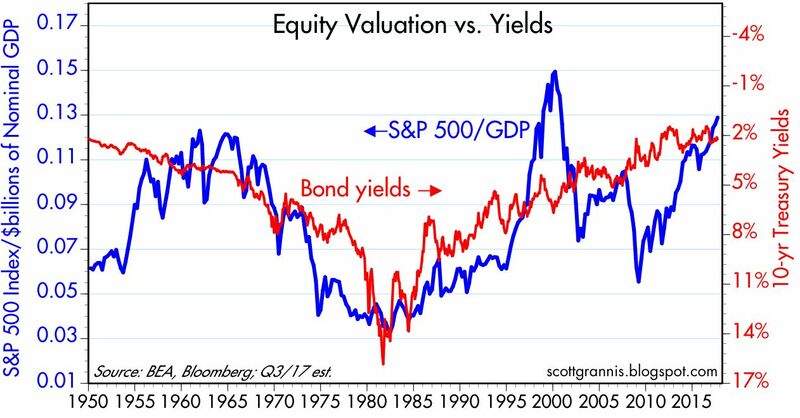 As the chart above shows, the value of US equities relative to GDP tends to fluctuate inversely to the level of interest rates. This is not surprising, since the market cap of a stock is theoretically equal to the discounted present value of its future earnings. Thus, higher interest rates should normally result in a reduced market cap relative to GDP, and vice versa. Since 10-yr Treasury yields—a widely respected benchmark for discounting future earnings streams—are currently at near-record lows, it is not surprising that stocks are near record highs relative to GDP. If the economy were $3 trillion larger, however, stocks at today's prices would be in the same range, relative to GDP, as they were in the late 50s and 60s. Valuations are relatively high, to be sure, but not off the charts nor wildly unrealistic. 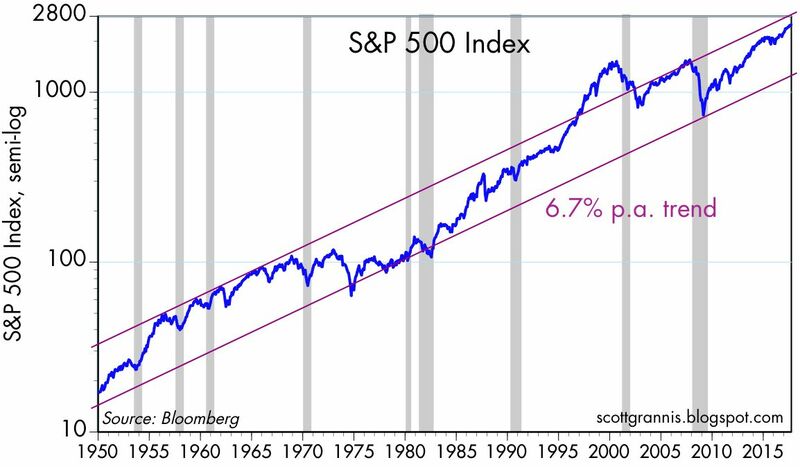 As the chart above suggest, over long periods the value of US stocks tends to rise by about 6.5% per year (the long-term total return on stocks is a bit more due to annual dividends of 1-2%). 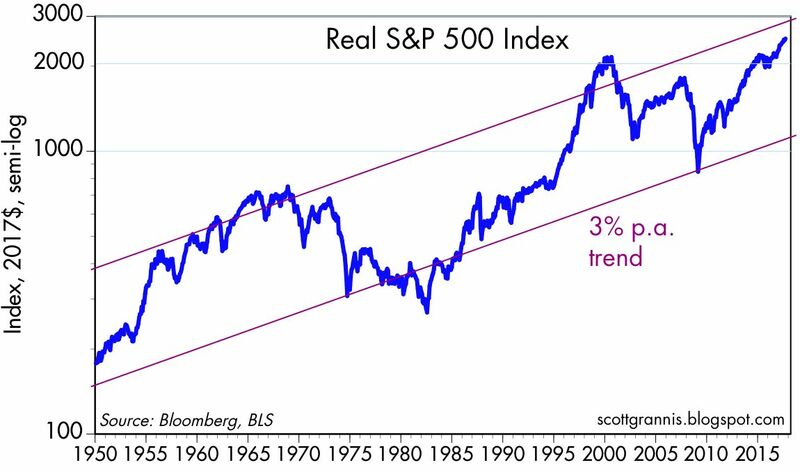 The chart also suggests that the current level of stock prices is generally in line with historical trends. 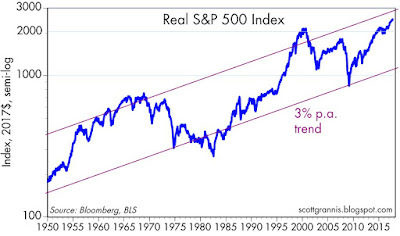 Adjusting for inflation, we see that stock prices tend to rise about 3% a year, and the current level is not unreasonably high, as it was in the late 1990s. 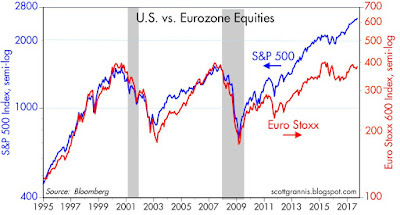 US equities have significantly outpaced Eurozone equities over the past nine years. That has a lot to do with the fact that the US economy has grown faster as well. 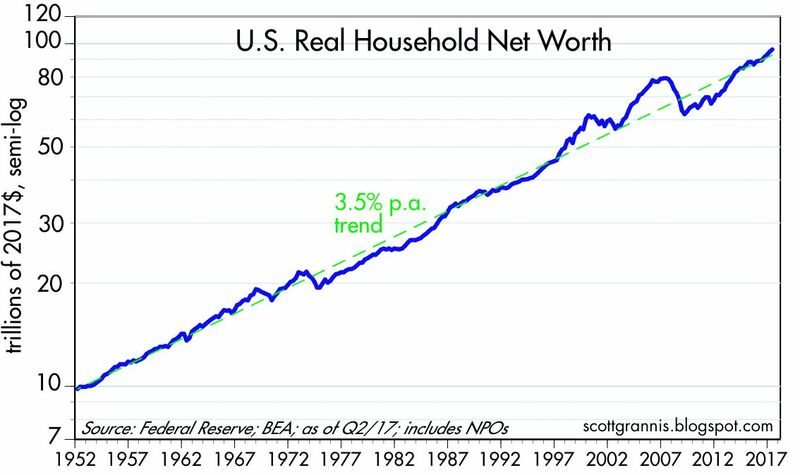 US households (i.e., the private sector) have a net worth that is approaching $100 trillion. That figure has been growing at about a 3.5% annualized rate for a very long time. The current level of wealth is very much in line with historical experience. Adjusting for inflation and population growth, the average person in the US is worth almost $300,000. 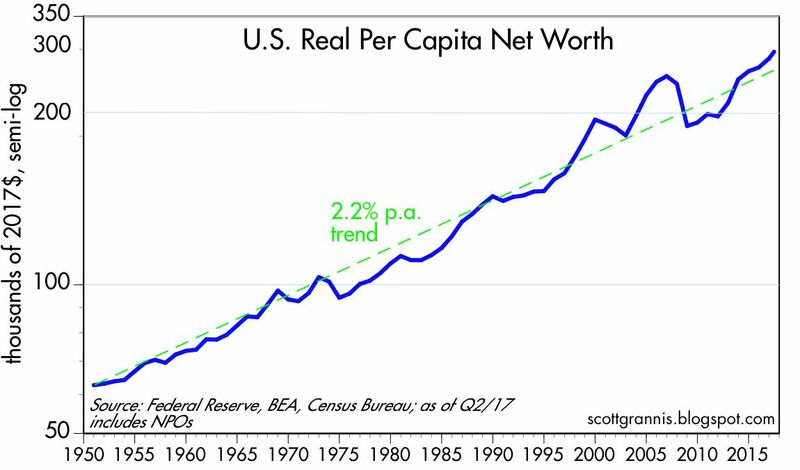 That is, there are assets in the US economy which support our jobs and living standards (e.g., real estate, equipment, savings accounts, equities, bonds) worth about $300,000 per person. We are richer than ever before, but the gains are very much in line with historical experience. Wonderful charts. 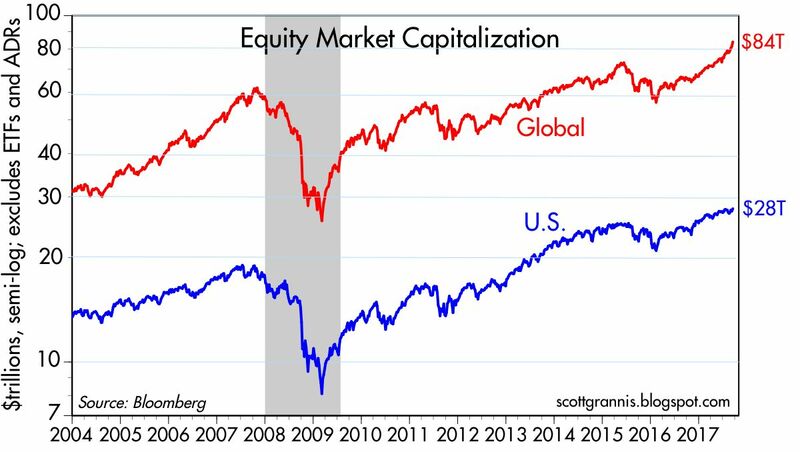 For me, it is remarkable that the US remains so large relative to the global economy. With all of our problems, I guess we are okay compared to what is out there. 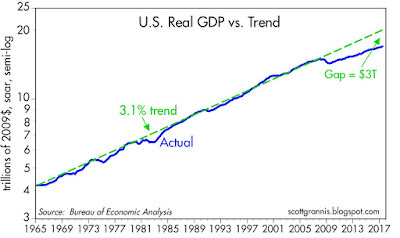 "If this shortfall in growth is due, as I've argued over the years, to misguided fiscal and monetary policies, then the US economy has significant untapped growth potential and could possibly be $3 trillion larger today if policies were to become more growth-friendly." ---Scott Grannis. I tend to agree with this, though I would add ubiquitous property zoning is suffocating economic growth in many regions of the country (and as a result, nationally) and I contend monetary policy has been too tight for many years, also asphyxiating growth. In fact, escalating house prices can trigger Fed tightening--as we saw in 2007. Housing starts, for example, remain far below historical norms. Yet the US has a growing population. Try building new housing in L.A. or Orange counties. Everyone becomes a pinko. The Fed sees the rising house prices….wants to "fight inflation"…look out below! I think zoning laws are a good example of misguided fiscal policies. Fiscal policies designed with the best of intentions almost invariably produce perverse and "unexpected" results. One of the best examples of this is our "progressive" tax system, which creates huge increases in marginal tax rates as one moves up the income ladder. This has the effect of making it extremely difficult for people to escape their poverty trap. There are many examples of middle- and lower-middle-class people who face marginal tax rates greater than 100%. Zoning laws are supposedly designed to ensure quality of life (e.g., uncrowded conditions, green spaces, etc) but end up making housing so unaffordable that people on the lower end of the income scale must endure punishing and expensive commutes. I am truly shocked by that chart. 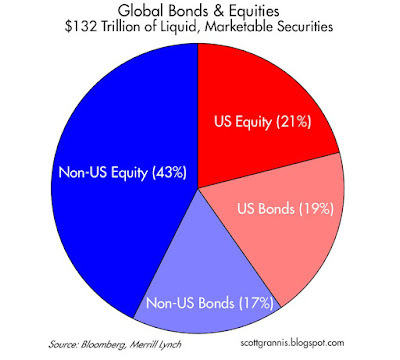 I always thought the bond market was bigger than the stock market...especially in the US. Boy, was I wrong. Thanks for posting that. After Harvey devastated Houston, there were plenty of editorials across the country basically saying the flooding is Houston's own fault for lax building regulations. Urban sprawl allowed without oversight. Without a doubt, there were some neighborhoods built in the wrong place. On the other hand, some of the worst hit neighborhoods have been there for 70 years and saw the worst flooding in their history. In any event, I couldn't help but think... so which urban model do these moralizers prefer? San Francisco, Seattle, Portland, or anywhere in California? Prices are so high that even well paid residents can't afford it. At least in Houston, a typical family can afford a decent home for their family. Johnny: your intuition could be correct. Bear in mind that the numbers I'm using are based on outstanding bonds that are liquid and marketable. That excludes are a lot of older and smaller issues that no longer trade frequently. A lot of muni bonds fall into that category, for example. randy: my understanding of Houston's problem was inadequate flood control infrastructure. "Several areas experienced 24-hour rains that on average occur every 1,000+ years (have a .1% chance of occurring in any given year). Early indications suggest longer duration (48- and 72-hour) rainfalls were even rarer"
It's likely that even the most aggressive flood control infrastructure would have massively failed anyway. No one is really saying it, but I think there is an implicit cost benefit trade-off going on in city planning. It may take a trillion in flood control infrastructure to have a chance of dealing with this (and probably would've failed anyway), but the damage may cost $75 billion. People like to live in nice places and nice places are not necessarily the safest places to live. Let's remember that much of CA is ready to fall into the ocean and burns every year! FL just got hammered, the mid west has tornadoes, the east coast can get whacked with hurricanes. Let's not forget Sandy. I live in central NH and we get whacked with snow storms. LIFE is risky and let's hope that Harvey and Irma were once in a generation storms. Not much any planning can do if mother nature really gets pissed off! It has been awhile since I have dropped you a Thank You! !😀 note. I always appreciate, respect and look forward to the commentary, statistical data and information that you provide. Scott. 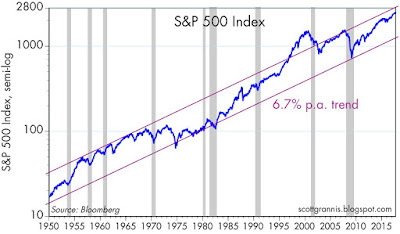 That s&p 500 vs gdp graph..that always concerned me a bit. It also is Warren buffets fav. What is your opinion on what this says in thr long long term. 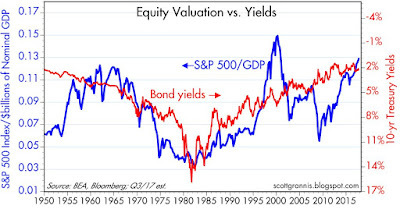 To me there is either a lower real rate of return in our cards for the next several years or gdp has to pull out of the 2 percent funk and go on a tear more that the s&p does (the later being counter intuitive ofcourse but gdp is not strongly correlated to the stock market. I am not a permanent bear at all but it makes me a bit nervous. are concentrated in the top 10% by adjusted gross income. but that doesn't make the bottom 90% feel better. up from 75% in 2016. Alain, re prospective returns. There is one obvious conclusion to the observation that the SP/GDP ratio is high: prospective returns on US equities are highly likely to be significantly less in coming years than they have been in previous years. Even if GDP growth picks up, I would not expect future returns to exceed past returns. Stocks began this recovery in 2009 at an extremely cheap level; they are now priced to something close to "fair value" or slightly rich. Looking ahead we are not going to see fabulous returns repeat. rich: When you have an economic and financial market boom, there is every reason to expect the rich to benefit disproportionately. But that does not mean the rest of the population suffers. Living standards are rising for all. If there is a large subset of the country that prefers to spend all or more of their rising incomes that is hardly something that can be addressed at the macro level. Txs scott. Going to be a alow grind for a while. Or until the next recession takes down valuations.